The recent trend of xenophobic attacks in South Africa is more of an end time story to me. It is a nightmare one is bound to experience after being under the heavy influence of alcohol. In another sense, it was expected but not to this height of inhumanity. South Africans have expressed hostility towards Nigerian foreigners in the past; they have seized every opportunity to attack Nigerian nationals. They have accused them of engaging in internet fraud, drug pushing and burglary. Most of these accusations are unfounded and based on jealousy and hatred. Nigerians are known to be highly hardworking and enterprising, making use of limited resources to satisfy their unlimited wants. Other foreigners have achieved this great feat too. It has been a slap on the face of South Africans that these foreigners excel big in their own country where they are only blinded by the challenges. The exotic cars and luxury houses of these foreigners have brewed upon a bitter hatred and envy which has been kept at low ebb. They waited earnestly for an opportunity like this to come so that they could vent the long term anger on innocent foreigners. Success is not a crime, not in any country in the world. Lebanese and Koreans have succeeded massively in Nigeria; exploiting workers to gather unimaginable profits. No revolution whatsoever that could warrant an awful event of the magnitude of the South African xenophobic attacks has been recorded. What happened to the competitive spirits of South Africans? Have they lost hope and retired to physical attacks for economic competition? This is certainly a feature of the medieval period of backwardness. A careful study of the events that preceded these xenophobic attacks revealed that the South African Police force have been used as a quiet, effective and legal tool to oppress foreigners especially Nigerians who are frequently raided under false allegations and bailed with heavy bribes. Some have been maltreated, tortured, locked up and even killed for no just cause. It has only been concealed because it was never this rampant and public. Back to the xenophobic attacks, South Africans haven't only behaved in an animalistic way but they have also betrayed the African brotherhood bond. They have disgraced Africa before the international community. It is so barbaric for life to ever degenerate to attacking your fellow human being no matter the country or race or colour with weapons and burning them for no just cause. South Africa is a country that has attained a high position on the map of enlightenment and development. This is expected to reflect on the quality of thoughts of the citizenry. The only time I experienced the issue of men hunting for the lives of other men was in 2011 during the post election crisis in Bauchi state, Nigeria. We all know the state of the northerners in terms of education and exposure. They are very wonderful people that can guarantee impressive hospitality for strangers at any point in time. The only impediment is the fact that their loyalty to their leaders and gullibility has been severed exploited by some people of doubtful characters to brainwash them with lies. So they swing into barbaric actions blindly. This isn't expected of South Africa that can even boast of a better educational system and other social infrastructures ahead of Nigeria. The educational system has failed to transform the psyche of the people. It hurts more that the xenophobic attack came from a careless and inciting speech made by a rabble rouser called King Goodwill Zwelithini. “Most government leaders do not want to speak out on this matter because they are scared of losing votes. “As the king of the Zulu nation, I cannot tolerate a situation where we are being led by leaders with no views whatsoever. “The fact that there were countries that played a role in the country’s struggle for liberation should not be used as an excuse to create a situation where foreigners are allowed to inconvenience locals,” Zwelithini said. Kings in the past are representatives of the gods. What they speak becomes a law and everybody abides by their words. They are feared and seen as perfect people. They are respected for their words of knowledge and wisdom due to their sage status. Contrary to this, this Zulu King has betrayed his status as a King. He just proved to the African community as well as the world that the position of the King is just a ceremonial role which has been kept over time to serve as a remnant of the ever dying African culture. Tears rolled down my cheeks uncontrollably when I saw gory images of innocent foreigners burning after being machete and stoned to death. These are people with families at home who came for a better future. People that have in one way or the other contributed to the economic development of South Africa. It is psychologically better to lose a loved one to sickness than such a brutal and avoidable act of sheer wickedness. An acute sickness prepares the minds of family members and friends that the patient may not make it, hopes begin to fade away compared to the scenario of an able-bodied person leaving the house for work with the hope of returning to the warmth of his family members just losing his life abruptly. This is the 21st century and not the Stone Age. If South Africans whose country is being rated as a developed country in Africa by some organizations can perpetrate such evil under the guise of being dominated by foreigners, then there is an impending problem in Africa and the world as a whole. They have just presented themselves as terrible models. South Africa might be developed in the areas of education, welfare, infrastructural facilities but intellectually, they are not. The country needs to review their educational curriculum and instill sanity coupled with discipline in them. Imagine the lethal damage an action like this could do to the world if other countries follow suit. Over 10 Nigerians have been reportedly killed and burnt to death while the Minister for Foreign affairs II, Musiliu Obanikoro denied the death of any Nigerian which attracted disbelief. 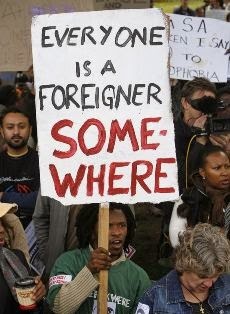 South Africans are also foreigners in several parts of the world. At one point or the other even the president/prime minister of a country becomes a foreigner somewhere. Such a bloody action of no conscience could throw the world into a world war if not properly managed. A blood-thirsty leader could authorize an onslaught on South African foreigners in his country either officially or unofficially. Things took a dramatic turn of degeneration when the world renowned Nigerian terrorist and leader of the dreaded Boko Haram sect released a video to publicly condemn the xenophobic attacks in South Africa and probably threatened the country as part of what he does best. If events could go so haywire in the world that terrorists that are known for illogical and disillusioned thoughts will be the ones to call us to order then the world is in for a huge disaster. MTN Nigeria (with above 57 million subscribers, and a net worth around $10 billion ~ N2 trillion). Some of these companies like MTN and Multichoice have been tolerated without revolution despite their series of exploitative inefficiencies. Picture the economical development South Africa enjoys from the remittance of money from these international companies who have been also guilty of abusing labour in Nigeria and going unpunished. The King of Zulu and other shameful South Africans should be educated on the economic effect of losing these companies in Nigeria and other countries. On a lighter note, I am not calling for a revenge on South Africans. Most of the perpetrators of this evil acts are faceless. Innocent people will pay for their sins if vengeance is introduced. That doesn't promote unity and peace too. An eye for an eye will make the world blind according to Mahatma Gandhi. I hope South Africa remains the same. I can imagine how these foreign traders will start to pick up their lives from the huge loss of unrestricted looting of their merchandise. It took some of them years to build a business empire that just came crashing in a couple of days. I wonder how a foreigner whose life was hunted for days will look at a South African in the face as a brother, sister or a friend as it used to be. Will there ever be love again? Will there be a re-occurrence of this dreadful incidence? How can it be curbed against a future repetition? These are rhetorical questions I don't have much answers to. It will take time for wounds to heal. May God console the bereaved. Frankly as a deterrent measure, all individuals involved in this violence should be apprehended and duly prosecuted. There are pictures of attacks that could serve as leads to the identities of the participants of the mayhem. The CCTV images should be processed. The King should be taken to ICC for due punishment. This was a measure the United Kingdom employed in 2011 during a massive protest in London. Between Saturday 6 August and Thursday 11 August 2011, thousands of people rioted in several London boroughs and in cities and towns across England. The resulting chaos generated looting, arson, and mass deployment of police; five people died. Following this crisis, more than 3,000 people were arrested in connection with the unrest. Today normalcy and sanity has returned to the UK. This can be a corrective measure to restore the fear and respect for the law in South Africa or else a re-occurrence can’t be guaranteed. I urge all affected persons to remain peaceful as events are being diplomatically sorted out.